Saint Nicholas' Day, observed on December 6 in Western Christian countries, December 5 in the Netherlands and December 19 in Eastern Christian countries, is the feast day of Saint Nicholas. 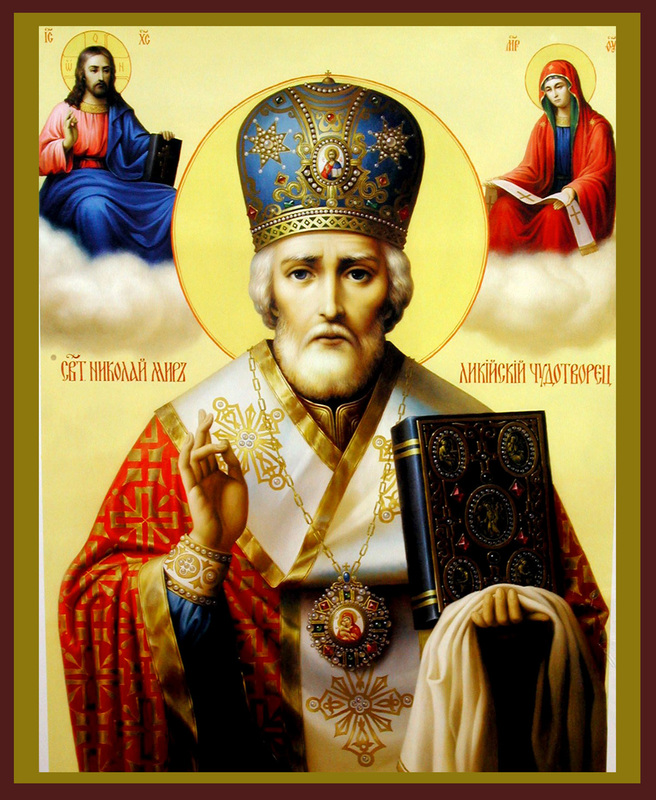 In Orthodox Christianity St. Nicholas, whose name means "Victorious" is revered as a master of fishermen. According to the mythology of the world was divided him be dropped seas, rivers and lakes. He is the master of the whole underwater world - fish and water demons. Name Day celebrate Nicole Nicholas, Nicholas, Nikolina, Nikolinka, Nicoletta, Nenka, Nina, Ninka, Kolyo, Nico, Nice and others. The Bulgarians for "wet Saint Nicholas" or "fish saint" are varied. He is described as a winged young man with unusual physical strength, which fly with golden wings over seas and oceans and enter into hot water battles with demons. In other cases, it was called old, winter St. Nicholas and is described as a white-haired and white-bearded old man. Christian iconography depicts it like a grown man. Mandatory element in rituals that day is the preparation of fish whose body is covered with scales. Most often it is a carp because, according to legend carp is "servant of St. Nicholas." Once the saint sailed the boat at sea, strong waves cracked floor. The St. Nicholas caught a carp with it clogged the crack. So rescued from drowning their companions. Therefore it is the custom to sacrifice carp in honor of the saint. On this day every Orthodox should eat fish. That is why people say, "On St. Nicholas Day one must pochopli teeth ribya bone, although the garbage to take it." When preparing a carp or other fish with scales (barbel, bream), the scales should not roll on the ground and no one to step on them to not befall him trouble. The bones of St. Nicholas' Day carp are not disposed of and incinerated, buried in the ground or placed in the river - it is believed that both shall live and multiply fertility and family well-being. Bone from the top of carp that is in the shape of a cross and is called "krahche" older women sew Kapitsa children to protect them from evil forces and evil eye. On St. Nicholas Day on the table except Rybnik and ritual breads, there must be meatless dishes: boiled corn, wheat, vegetable leaves, peppers, beans. According to the legend of St. Nicholas brings first snow - shakes his long white beard and it is poured first snowflakes. If St. Nicholas appeared frost, it's good for cereals. It is known saying: "Today is the day, tomorrow is snow" At St. Nicholas make predictions about future weather and harvest. St. Nicholas is considered the patron saint of family and kin, guardian of the home, property and goods. For its honor him as fishermen, traders kiradgees, miller, hunters, bankers.